You might see posts this month in a friend’s social media feed, that talk about Myasthenia Gravis. You might think, “Oh well, one more ‘awareness’ post.” But when people speak about cancer, others know what that is. When people speak about autism, people at least have a rough idea of what that means for someone. But what about Myasthenia Gravis? 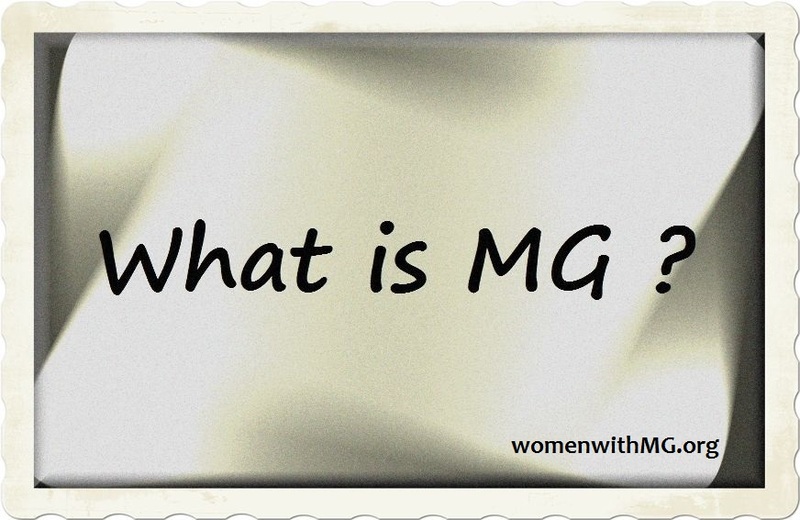 In our previous post, June is MG Awareness Month, we spoke about one of the reasons that we need increased awareness. There are many more. An anesthesiologist treating an MG patient should know that there is currently no cure for Myasthenia Gravis. A physical therapy assistant should know that they could kill an MG patient with this sort of malpractice. Paramedics and nurses should know that MG patients often struggle to breathe without it impacting their blood oxygen level. Because the muscles are struggling before it has impacted blood oxygen levels. This is the warning time. The time to get help, while things can potentially still be improved. At times, MG patients can have a normal blood oxygen level right up until the moment before they need to be put on a ventilator, to hopefully save their lives. Respiratory weakness in an MG patient should always be taken seriously. Now those are stories about people working in the medical field, who should know better. But what about the average person one might meet… in say… a parking lot. Average citizens should know that not everyone who is disabled is in a wheelchair. 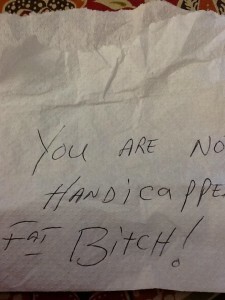 That doesn’t make their disability any less valid. 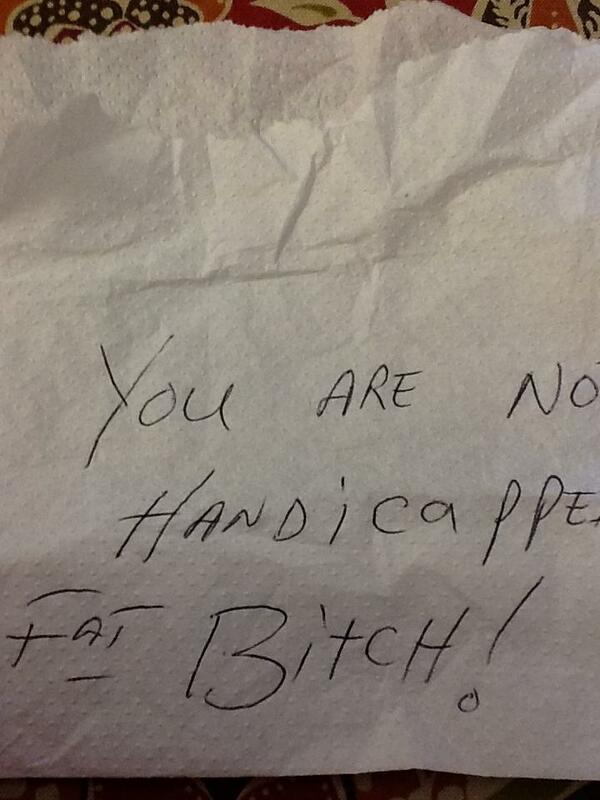 And not that it should matter, but the woman who received this hate-filled note, she isn’t overweight at all. And what if she had been overweight? Did you know that treatment for MG often involves a drug that causes *massive* weight gain? Often times the weight comes on no matter what a person eats or does, it is simply a side effect of a drug they take to try to stay alive. Did you know that? If not, now you do. Please share this post and help us spread the word. MG causes us to have many struggles in life. Those struggles shouldn’t have to include medical malpractice and critical judgments from those who have never lived a day in our shoes. We don’t want or need pity from others. We are a pretty awesome group of people, living the best lives that we can, each and everyday. What we do need from others, is more understanding from our peers and better education for those who treat us. We know this is not a common disease. We don’t expect everyone to know everything. But it’s much better to say, “I don’t know” than to assume the worst, or do something medically incorrect. Women with MG has members from all over the world. Throughout this month we will bring you personal stories, written by some of these women, telling you about their lives and their experiences. We hope you will take the time to read them and perhaps share them with your friends. Thank you! I am sorry. Praying for a cure. GOD bless. This is a very good article to bring awareness to MG. I hope that a great number of people will take the time to read this and bring themselves to a better understanding of a potentially life threatening illness.